American industrialist Henry Ford once said, “If everyone is moving forward together, then success will take care of itself.” Ford was no doubt speaking on the basis of his business expertise but some 150 years later, his ideas of success are still in motion at the Combustion Research Facility (CRF). In keeping with the concept that research is most effective when moving forward together, Sandian Lyle Pickett developed the Engine Combustion Network (ECN). Made of groups from all over the world, the ECN grew out of a strong need to make computational modeling more predictive for engine design. Advancements are made only when the computational models are based on conditions most appropriate to engines, but there are noticeable gaps in the data that are available. Says Pickett, “Our research focuses on spray combustion in a controlled chamber at high temperature and pressures, paying attention to conditions that inform computer modeling. Researchers have developed a handful of these chambers throughout the world but never compared their performance. 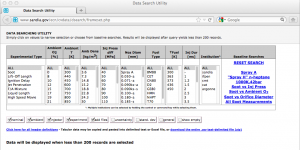 Although our own datasets are quite limited, they are widely requested by the engine computer modeling community.” It would be easier, he thought, if the datasets his group generated were easily available and searchable by parameter set. Better yet, he brainstormed, would be to invite other researchers in different aspects of engine design to work under the same parameters, and then meet to discuss for mutual benefit. Modeled after the Turbulent Non-premixed Flames Workshop, a similar effort at the CRF in turbulent flames research, the ECN received support as a collaboration between international research groups each working in their own labs with the same equipment and parameters. 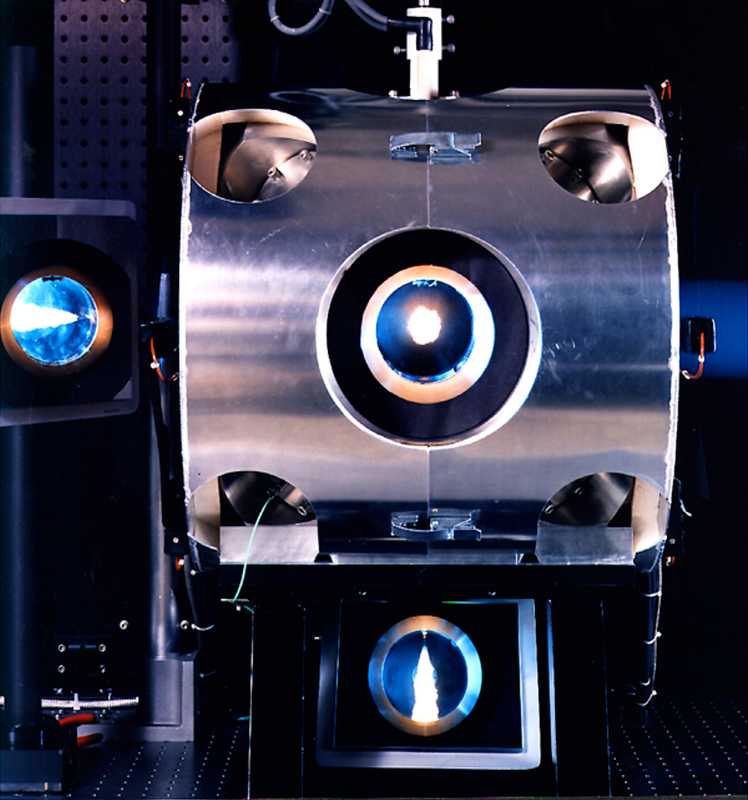 Pickett developed a website archive for past data (http://www.sandia.gov/ecn), then proposed an initial set of conditions for future research to the engine community (The CRF’s experimental setup is shown in Figures 1 and 2). Automotive parts supplier Bosch donated fuel injectors for the work. The ECN formed and delineated their goals: first, establish an internet library of well-documented experiments appropriate for model validation and the advancement of scientific understanding of combustion at conditions specific to engines. Second, provide a framework for collaborative comparisons of measured and modeled results. And third, identify priorities for further experimental and computational research. 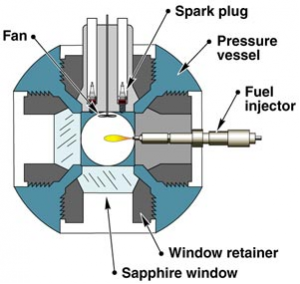 Figure 1: Schematic of the CRF’s Spray Combustion Vessel, which can simulate a wide range of ambient (charge gas) environments at the time of fuel injection, allowing researchers to assess the effect of each variable with more control than can be achieved in an engine. After international participants joined the ECN and research commenced, the group convened at a workshop now called ECN1, held in Ventura, California from May 13-14, 2011. Sponsors from the French ministry paid registration costs for the workshop and Pickett worked with Gilles Bruneaux from IFPEN to co-organize the event. Results from experimental and modeling efforts were presented in topical sub-groups with organizers leading the collection and analysis of data prior to the meeting. Fifty-three researchers attended the workshop in person, with another 16 attending by webcast, and even more accessing the results and workshop materials since. Overall, the results of ECN1 were impressive. First, results from experiments and computations between different facilities were compared to see if the community was correctly controlling their boundary conditions. The data obtained showed good repeatability, implying they were on the right track. Second, the experiments were studied in order to understand better the functional components in engine design. For example, the effects of fuel temperature and composition on performance and the development of sprays were studied by some while others focused on injector shape. Individual groups tackled focused aspects in their work but when many groups looked at overlapping experiments, a clearer picture began to emerge. ECN2, which was held this September in Heidelberg, Germany, had the same format as the first meeting. Research activities were presented in sub-groups such as soot formation or internal nozzle flow; side-by-side comparisons of experiments and models were made; and recommendations for future practices were decided. Pickett emphasizes that most of the work and effort to coordinate the experiments and models occurs before any workshop, aided through regular web-based meetings. The uniqueness of this workshop is that people come willing to share their spray combustion work, compare data, and work on-site to improve their understanding of engine processes in a manner that’s different from a typical conference. From the enthusiastic support the ECN garners, it’s clear the investment is a worthwhile one. 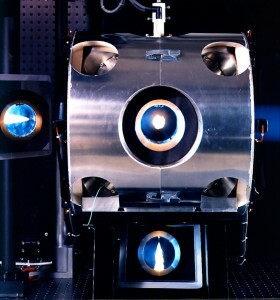 Figure 2: The CRF’s Spray Combustion Chamber. Simulated conditions range from ambient gas temperatures of 450 K to 1400 K, ambient gas densities of 1 kg/m3 to 60 kg/m3, and ambient gas oxygen concentrations of 0% to 21%. A sapphire window allows full optical access. The two main workshops are certainly the highlights of the network, but that doesn’t mean the community stays idle in between. In fact, constant collaboration and dialogue is a necessary component of running comparative activities. A major web-based workshop, dubbed ECN1.5, netted 125 attendees; in addition, topical sub-groups meet every few months over the Internet. Datasets and other tools are offered through the ECN website, with improvements and additions constantly made in an ongoing show of community effort. 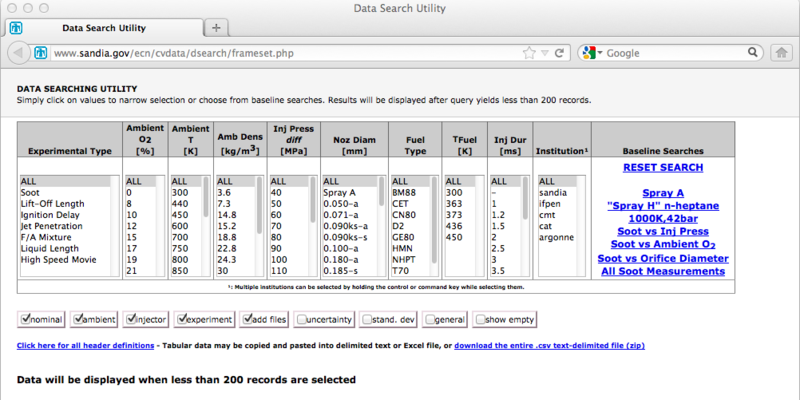 The website features a searchable database (Figure 3) open to the public. Directions on how to become part of the network are also found on the website. What does all of this come down to? In a phrase, better engine design. Improved understanding of experimental results and modeling predictions leads to engine designs that can be optimized before implementation, with a great savings in both cost and time. This, in turn, leads to higher efficiency, lower-emission engines available sooner and more cheaply than what would be on the market if these researchers followed the traditional model of working independently. Figure 3: Searchable Database on the ECN website. Search parameters are Nominal Ambient Oxygen Concentration [%], Nominal Ambient Temperature [K], Nominal Ambient Density [kg/m3], Nozzle Size or Orifice Diameter [mm], Nominal Injection Pressure Difference [MPa], Nominal Injector Duration, Fuel Type, andNominal Fuel Temperature [K]. A key aspect of the CRF’s mission is to encourage collaborations with diverse partners around the world. The ECN is a fine example of such collaboration, and of Henry Ford’s model in moving toward success. This work was conducted under funding from the US Department of Energy Office of Vehicle Technologies. Please visit the ECN website (http://www.sandia.gov/ecn) for a listing of other participating institutions and their sponsors.